If anything, the Monash University Foundation Year (MUFY) students are well-aware and more than willing to be a part of the MUFY ‘Sharity’ Carnival, a charity event organised annually. ‘Sharity’, held at the Energy Hub cafeteria was overflowing with energy as teachers and students made their way over to purchase delicious food and drinks, fashionable clothes, games, beautiful accessories and even pampered themselves with manicures and pedicures. Lecturers and students presenting a mock check to Prof. Dr. Hany Binti Mohd Ariffin, Senior Consultant Paediatric Oncologist (centre), UMMC. The music and lyrics to Black Eyed Peas’ ‘Where is the Love’ was what inspired Farhana binti Farhan Menon’s essay on climate change that won best essay from Sunway College in the Monash Prize Essay Competition. “This is the song that touches my soul every time someone talks about climate change,” she wrote in her essay. “This war of human against nature has to stop. Most people think that the earth is going to be around forever. But what they fail to realise is that the more we take from earth, the more we lose something, especially when no measure has been done to replace it. We must stop wastage and take responsibility of our own actions,” said Farhana from the Canadian International Matriculation Programme (CIMP) who regularly recycles, reuses, and repairs in her daily life. Farhana receiving the Apple iPad from Aananthi Seventhy, Country Manager, Offshore – Future Students, Monash University, Australia. Sunway’s Canadian International Matriculation Programme (CIMP) students exercised their management skills through a one day charitable fundraiser as part of the requirement of their Business Leadership Management Fundamentals (BLMF) subject. 55 students used their management knowledge to create a company and sold unique products during a sale at the Energy Hub at Sunway College recently. 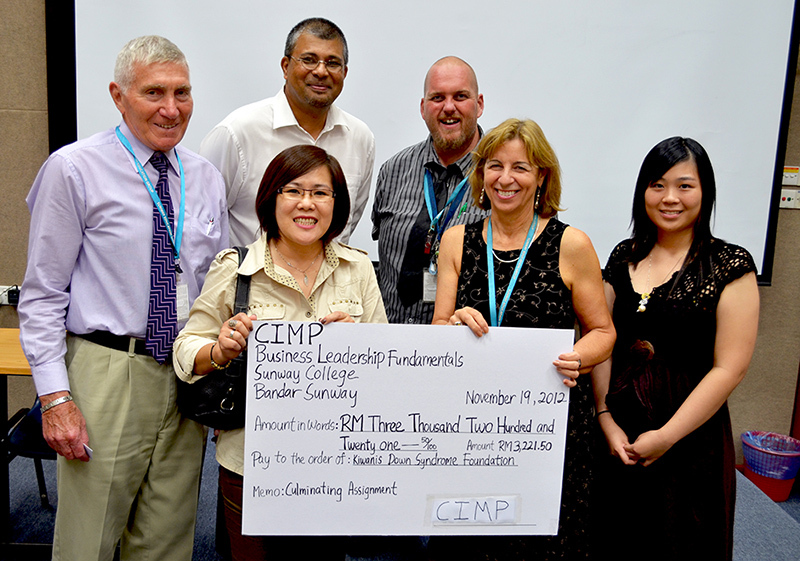 (From left to right) CIMP Director John Futa, Godfrey Rajalingam, Angie Heng, Lecturers Elizabeth Erskine and Dave Leonard, and Lee Siaw Teng.